Homeless people suffer, become ill, and pass away due to the hardship they endure living on the streets. Due to gentrification, former shelters in D.C. have shut their doors or been sold, forcing more into overnight stays at the city parks. 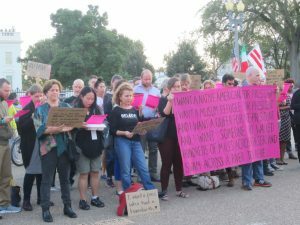 People for Fairness Coalition is helping draw attention to the need for a public restroom initiative, and housing as a universal human right. 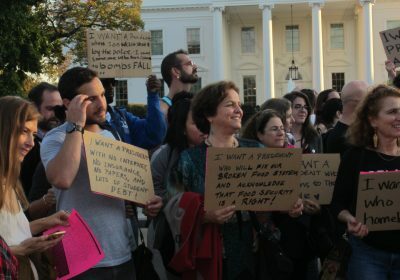 Occurring in the nation’s capital just weeks before the 2016 Presidential Election, the Creative Time Summit DC took this important moment to collectively consider what it might mean to radically transform the current state of democracy. Around the world both the left and the right are making their dissatisfaction with the center known, setting the stage for a virulent electoral season. The result is a collective adaptation of what we want our next president to care about, empathize, and act upon. Rethinking the presidency is based on a poem originally written by artist/activist Zoe Leonard in 1992. The 2016 text was developed through community-based workshops in DC and NY. For instance, one workshop was held at the Martin Luther King Public Library; another at Corcoran School of the Arts & Design. Textual analysis, selection, and adaptation for the live collective performance was co-organized by Natalie Campbell and Saisha Grayson. I want a Native American for president. I want a Muslim refugee for president and I want a queer for vice president and I want someone who walked hundreds of miles across a desert and swam across a river to be here, someone who grew up in a place where the tap water was poisoned and officials knew and ignored it….. Learn more about the project at iwantapresidentdc.com. Shen Yun Symphony Orchestra is making its way around the country this Fall. 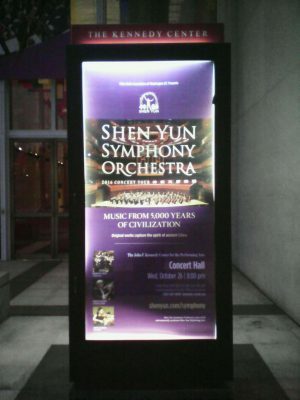 The symphony orchestra is the musical arm of Shen Yun Performing Arts. 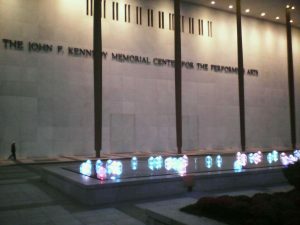 Its unique rich compositions, exotic instruments, and operatic performances are frequently incorporated into Shen Yun dance troupe’s latest seasonal performance (set to begin in December 2016). The aesthetic entertainment helps awaken audiences to the timeless beauty and culture of Eurasia, and foster appreciation for Buddhist Falun Dafa. The conductor was the world-renowned Milen Nachev. Eastern compositions were interspersed in the playbill. Included were beloved dance pieces from the 2016 season, such as the ethnic “Drums of the Grasslands” and sensuous “The Mystical Udumbara.” Compositions and lyrics are variously credited to D.F., Junyi Tan, Jing Xian, and Yuan Gao. Opera tenor Tien Ge sang “Life is Fleeting.” “Delicate Dance” featured three erhu soloists led by Xiaochun Qi. Not to be outdone, soprano Haolan Geng beautifully sang “The Moment of Salvation.” Standing ovations awarded the audience encores for the evening.